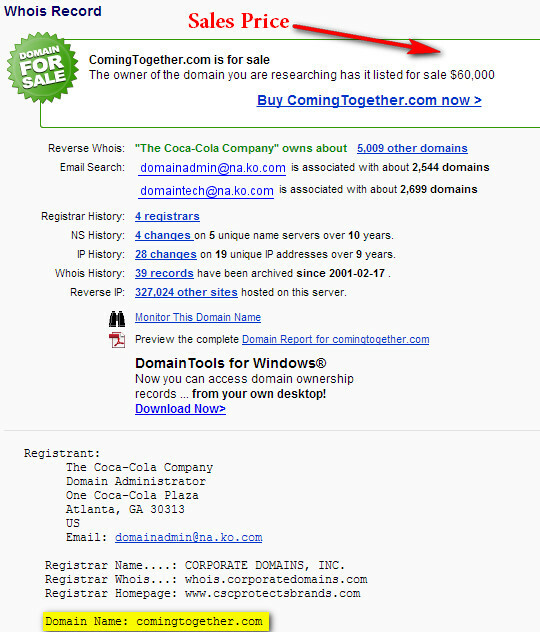 Yesterday I reported that the domain name ComingTogether.com was reported sold by Mike Mann on his Facebook page for $60,000 and today The Coca Cola Company is listed as the new owners in whois records! Electronic Arts has acquired the domain name BF4.com for the upcoming launch of the 13th installment of the very popular game Battlefield. The new BF4 game is set to launch in the fall of 2013. EA isn't shy in using great domain names, as they simply use Battlefield.com for the "main" domain name for the games site. Domain names can be some amazing little buggers! That's why I love them so much! You never know what you are holding and who wants your one of a kind piece of virtual real estate. Domain names can be extremely powerful when used in marketing, as it can easily direct a massive amount of eyeballs in one location! I Just About Shipped My Pants! Kmart of all stores came up with a commercial that has gone viral and it's funny! I think of Kmart and the 80's, empty parking lots and brown shopping carts. I hate the color brown and the 80's were some 30 years ago.